Now that the TRC Blog Tour is over (with a HUGE thank you to Jakki Leatherberry at http://leatherboundreviews.blogspot.com/ for being our tour guide), I am left with an excerpt that didn’t get used. Rather than have it languish, feeling sad to be left behind in a file of “excerpts for the tour” I will insert it here. The Set-up: In this scene, Elizabeth Bennet has already found the nosegay meant for her from Fitzwilliam Darcy. She has come to Pemberley in secret, and at Darcy’s behest, to create a scent for him to give his sister on the occasion of her seventeenth birthday. This is the reason for such secrecy as Elizabeth moves through the Pemberley cutting garden. Elizabeth marshalled her wits and began looking through the shelves and cupboards of the Pemberley stillroom. She found some attar of damask rose in a brown bottle that had not lost its perfume. Generally, the room was clean but the cupboards were a fright with drawers housing broken shears as well as those still useful. Open shelves were full of dust and grimy bottles with contents no longer fresh, most with faded labels. One cupboard was devoted to vases of all shapes and sizes and half a dozen were sparkling clean as though recently used. She developed an idea for a scent and started making a list of the items she would need just as the housekeeper returned to the stillroom. “May I be of service, Miss Bennet?” she asked. “Are you sure you should, miss?” Mrs Reynolds was worried. “I know what I want, and if the flowers I require are not there, I shall return directly.” Elizabeth took up the herbal and found a pocket in the cloak for it. Mrs Reynolds gave her directions to the garden. It was located off the southwest corner of the house in a walled area and she consoled herself that Miss Bennet would be on the opposite end of the house from any view to be had by the occupant of the music room. Elizabeth walked down a long dark hall, past little pantries of jarred fruit and curing meats. She squinted at the bright sun upon exiting the house and waited a moment for her eyes to adjust. To her right was a path lined with espaliered fruit trees; she had been told the cutting garden was at the end of it. She entered a walled garden and found Sweet William and scarlet lychnis growing there. She consulted the herbal. How much do I wish to say? I would not have him think me forward, but Charlotte always said a lady should leave a gentleman in no doubt. Elizabeth found the first blossom on a clump of red chrysanthemums and snipped it. Dare I say so much? She walked back toward the house, feeling her nosegay would not be as eloquent as Darcy’s had been. She saw a perfect peach hanging low over the stone path and stooped to pick it. It occurred to her that fruit might have meaning and she consulted the herbal. ‘Your qualities, like your charms, are unequalled,’ it read. Hmm, she thought, I could leave the peach sitting with the vase and herbal. He would understand they are meant to be together. As she walked back to the house, she noticed a swath of viscaria had seeded itself at the edge of the paving stones. She stopped, turning pages. It means ‘Will you dance with me?’ How marvellous! This is exactly what we should do! We should start over. Elizabeth picked enough for a whole vase full. Another path lined with garden plants beckoned to her left. She could not resist a little exploration. 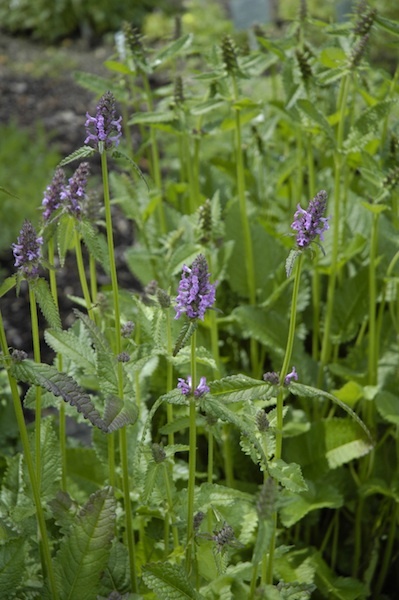 She found betony, the flower of surprise, and decided it would do quite well. Mr Darcy was now surprising her daily. Bearing an armful of flowers, she snuck back into the house. This entry was posted on November 16, 2013, in My Books, The Plants in The Red Chrysanthemum. Bookmark the permalink.